Arrr you ready for a swashbuckling coloring adventure? Color a pirate dinosaur with your first mate! As he adds some colors to this scene, see if he can tell you a story about this dinosaur-pirate. How did he get there? Why does he have a peg-leg? Why is this pirate riding a dinosaur? Is he out on a dinosaur ride? Is he training for the dinosaur derby? Let your child decide as he colors this picture. Don't try to steal gold from this pirate! He's an Ankylosaurus dinosaur who somehow got promoted to captain. Have your little adventurer come up with a creative story to explain how this pirate and this dinosaur came to meet! Your swashbuckling buccaneer will have fun coloring in this prehistoric pirate picture. With a few crayons and a crazy imagination (and maybe a few pirate puns), you and your child can color this king lizard. Pirate Billy needs help counting his treasures. Help your kid practice adding single-digit numbers and writing the sums on this treasure-themed worksheet. Your child will love coloring and making his own pirate props. 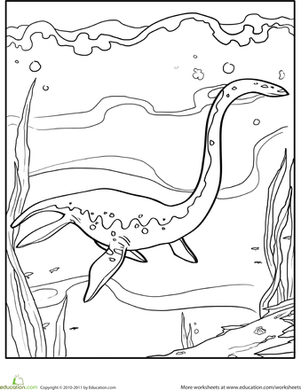 Dinosaur-lovers and ocean-lovers alike are sure to enjoy giving color to this prehistoric scene, featuring the underwater dinosaur, the Elasmosaurus. Arr, it's time to find some pirate treasure! 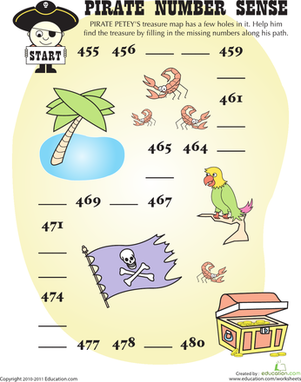 Kids get practice with three-digit counting as they fill in the missing numbers to find the treasure chest. What kind of dinosaur is it? Do this fun connect the dots worksheet to discover a cool dinosaur, and practice counting with your child! Bring out your inner pirate with these fun photo props! Whether they're for play acting or spicing up a photo shoot, your child will have a blast. 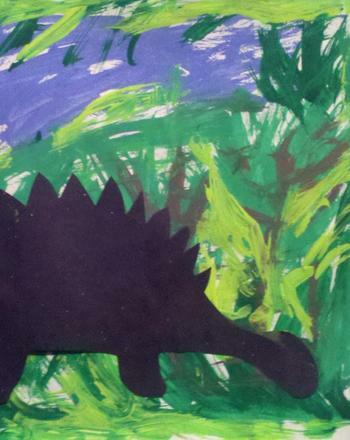 Travel back to the Jurassic age with this creative dinosaur activity that would make a great addition to any wall or fridge.